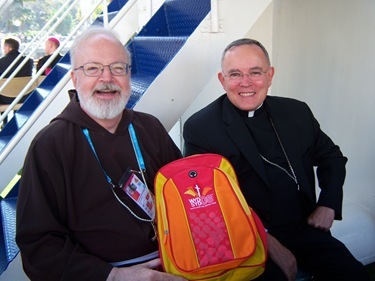 This week I am writing this post from Sydney where I am accompanying the Holy Father and a large group of Boston pilgrims for the celebrations of World Youth Day. 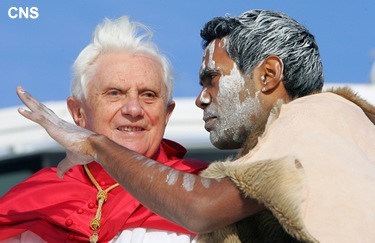 The Holy Father arrived in Australia on Sunday and spent a few days resting, to recover from the long trip. 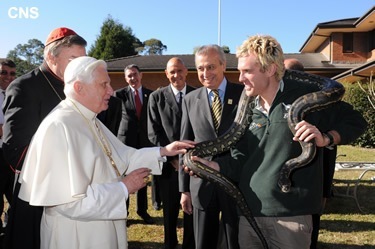 While he was resting at Kenthurst Study Centre in Kenthurst, near Sydney, the Holy Father was presented with a variety of Australian animals, including a python. 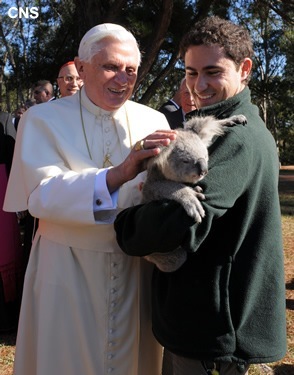 I thought you would like to see those photos of the Holy Father petting such animals. We arrived in Sydney on Monday. It was a long and tiring trip. I was glad to meet the archdiocesan group at the hotel. 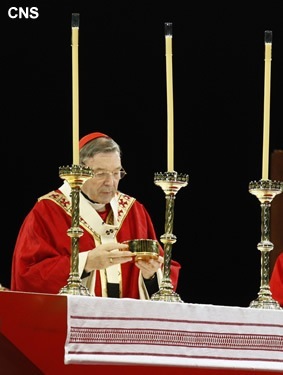 The inaugural Mass took place on Tuesday. 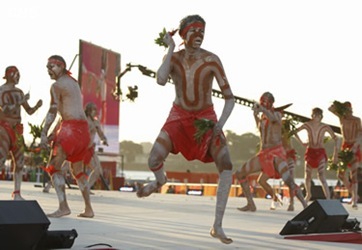 It was celebrated by Sydney’s Cardinal George Pell. 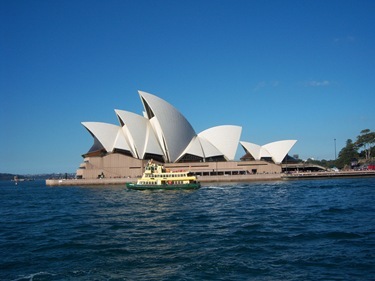 It was an afternoon event at the Sydney harbor and it was very beautiful. 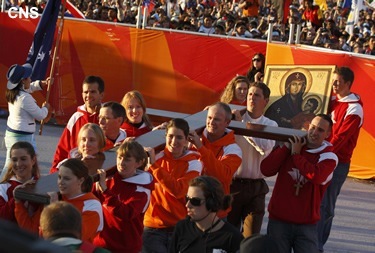 150,000 youth participated in the Mass. 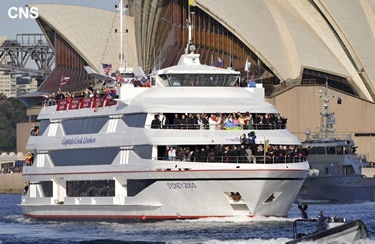 The bishops arrived at the place of the Mass, called Barangaroo, on a boat. 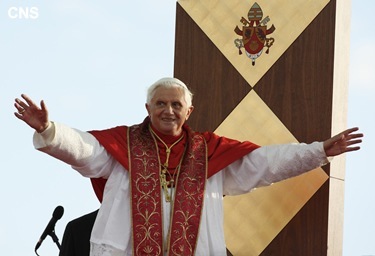 A couple of days later, the Holy Father also arrived at the same place on another boat. 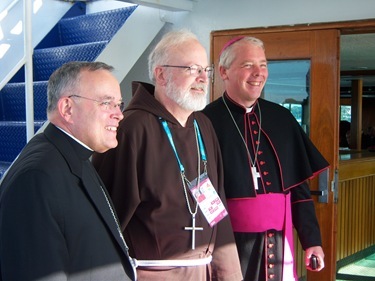 With Archbishop Chaput and Bishop Paul Hinder of Saudi Arabia – both bishops are OFM Cap. This year, the organization has stressed the importance of the catechesis. 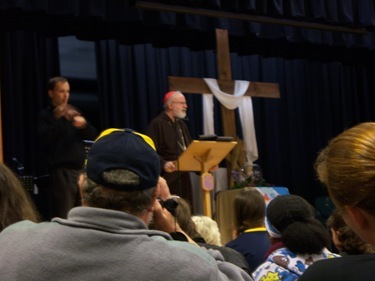 For three days during this week, speakers have given catechesis in over 250 different locations every day. These catecheses have been given in different languages so every pilgrim had a chance to attend. 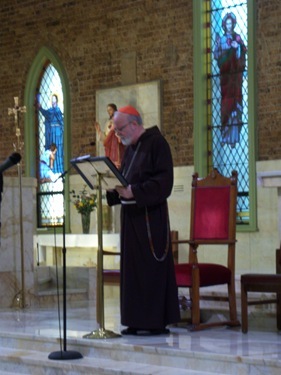 I had my first catechesis in the church of St. Fiacre which is an Italian parish that the Capuchins run in Leichhardt, in the outskirts of Sydney on Wednesday morning. 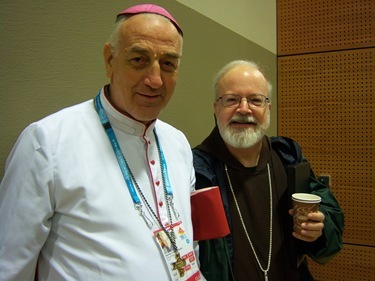 Father Jim Menkhus, OFM Cap., of the Pittsburgh Province. 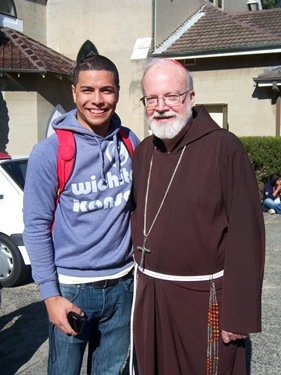 He introduced me at the Parish of St. Fiacre on Wednesday. 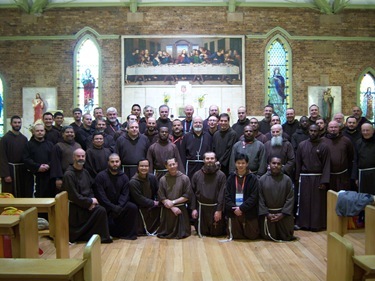 There were about 50 friars there and many young people who are parishioners in different Capuchin parishes in Australia. There were even some youngsters from Papua New Guinea and the Philippines. The first day, the catechesis was about “The call to live in the Holy Spirit.” I spoke for about one hour and then we had some reflections, questions & answers. There was adoration of the Blessed Sacrament before the conference and afterwards we had a Eucharist. Then there was a sort of a musical program in the town where I was , in a sort of a plaza they had there. This young man’s name is actually Seán O’Malley. His mother is from Fiji, and his father is from Ireland! 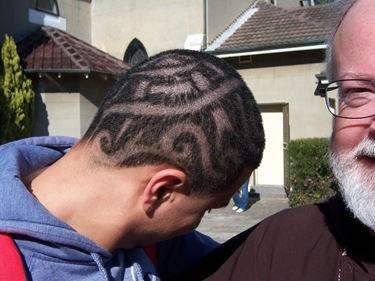 Some O’Malleys can get very creative with their hair cuts! 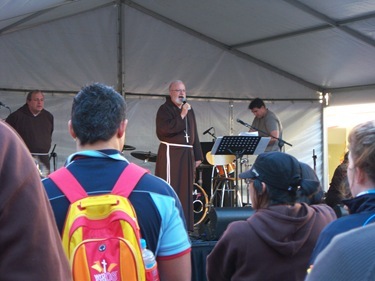 Thursday, I gave another catechesis at LaSalle College in Ashfield, a suburb of Sydney, with a much larger group of around 1500 pilgrims. 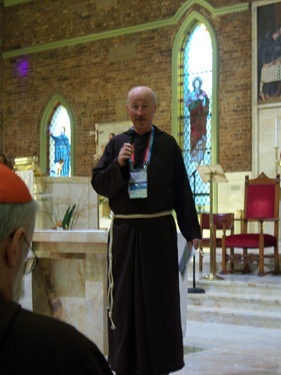 Bishop Francesco Panfila – a bishop from Papua New Guinea. There were a number of pilgrims from Papua at the catechesis on Thursday. 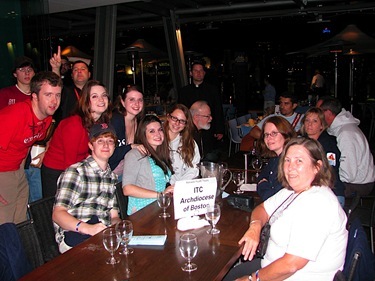 One of the Boston groups was present including some members of our deaf Catholic community. 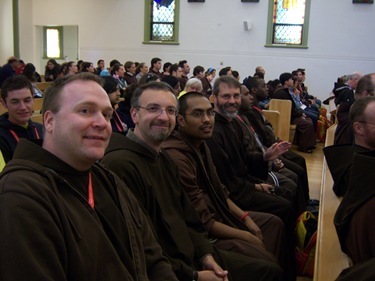 The theme for that catechesis was “The Spirit, the soul of the Church.” There was also a Mass afterwards. 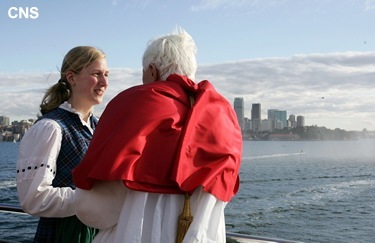 Then, in the afternoon, I came back to Sydney to go and be on the boat that brought the Holy Father in a sort of a big entrance for the welcoming ceremony at Barangaroo where we had the opening Mass. A number of the bishops and cardinals accompanied the Holy Father on the boat. It was a beautiful ride. The weather has been gorgeous. It is cool — it is winter here — but it was sunny. We went along the coast and huge crowds of people were waiting to see the Holy Father. 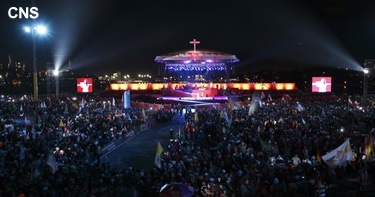 There were about half million people waiting to see the Holy Father. 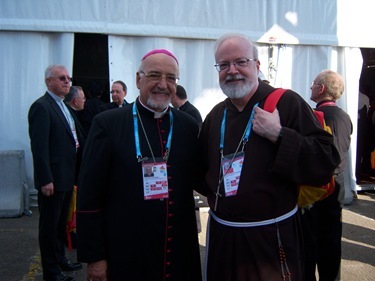 When we arrived at the park, the Holy Father led a liturgy of the word and after that there was a reception with the premier and in the evening there was a dinner with Cardinal Pell. Next week I will tell you more about the weekend events, that will include a Saturday evening vigil and a Sunday morning Mass with the Holy Father. Before that, I will have another catechetical session with the theme “Sent into the world. 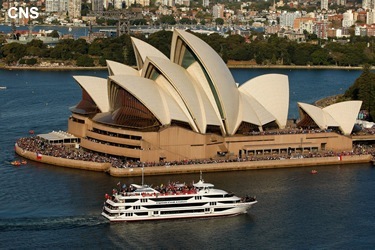 The Holy Spirit the principal agent of mission,” and in the afternoon of Friday there will be outdoor Stations of the Cross with the young people and later in the evening a concert in the famous Opera House of Sydney. They will have the Sydney Symphony play Beethoven’s Missa Solemnis. Then, on Saturday morning, the Boston groups will come together with me for a Eucharist, before attending the events with the Holy Father. Sydney is filled with pilgrims from all over the world. I am impressed by the great enthusiasm among the young people. There is a great sense of devotion and just joy. 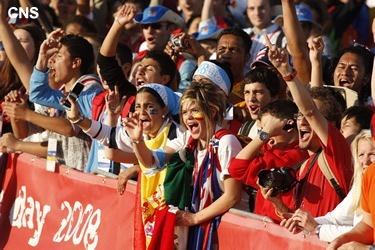 In some local papers there was kind of a hostile atmosphere at the beginning, but as time goes on and people observe the reactions of the young people, there has been more of a shift and openness to what the Holy Father’s visit can bring to the people of Australia. It is a great grace. Cardinal Pell did a wonderful job organizing this event. In fact this is the largest event Australia has ever hosted, even larger than the 2000 Olympics. 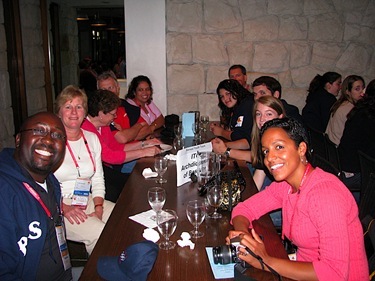 The largest number of pilgrims from outside of Australia are from the United States. The second largest group would be from Italy and the third largest group is from Germany and that is a great tribute to the Holy Father. 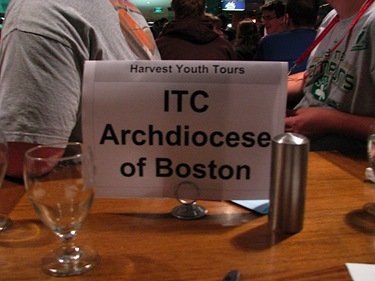 We have around 400 pilgrims from Boston, from a number of groups. 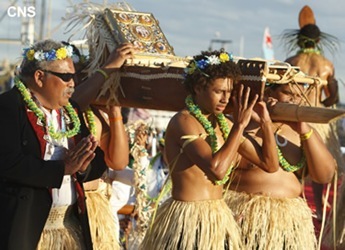 One of the great surprises is the large number of people that came from the Islands of Oceania, even from Papua New Guinea. The young people are very enthused. 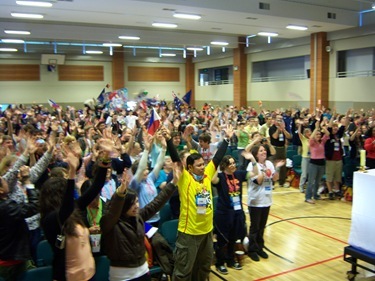 Many of them are making the World Youth Day for the first time in their life and certainly feel very affirmed in their faith by being with hundreds of thousands of their peers who love the same things and are devoted to the Eucharist, to the Blessed Mother, to the Church. 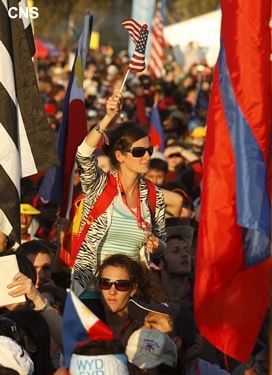 There is a great desire to promote vocations among the youth here at World Youth Day.